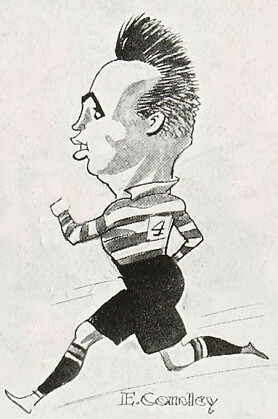 Ernest Comley was a versatile front five forward, who though primarily a prop, played for both Gloucester and Gloucestershire in the second row and was noted for his work in the line-out. 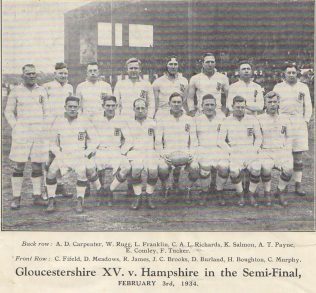 He played 272 1st XV games for Gloucester between 1924 and 1934. His 20 caps for Gloucestershire included three County Championship finals in which he was on the winning side against Lancashire at Blundellsands in 1930 and Durham at Blaydon in 1932 and on the losing side in 1934 at Franklin’s Gardens against East Midlands. Ernest Comley was born in 1904 in Gloucester, the son of Albert Comley a machine driller in an engineering works and his wife Emily. 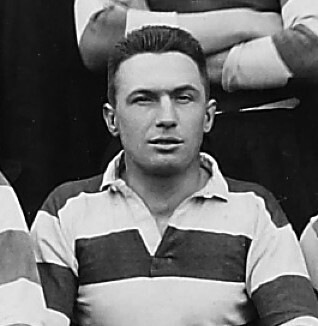 He joined Gloucester RFC aged 19 and after a season in the second XV, he made his senior debut against Cheltenham at Kingsholm on 22 November 1924. Ernest took a couple of years to establish himself in the Gloucester side, until in 1927-28 he appeared in 42 of Gloucester’s 44 games scoring 7 tries plus a conversion – his only successful kick at goal. He made his Gloucestershire debut in a friendly game against Monmouthshire in October 1929 and did not play again until the final against Lancashire at Blundellsands when he was called up as a late replacement for Bryant of Bristol. The Times said “The Gloucester forwards were well together, and from the line-out, E. Comley, surrounded by two or three of the Gloucestershire pack, frequently procured the ball and initiated short sharp rushes that carried play farther and farther into the home county’s territory.” Gloucestershire went on to win the game 13-7, giving Comley the unusual distinction of gaining a County Championship winners medal in his first County Championship match. Comley established himself in the Gloucestershire side in 1931-32, playing in all six County Championship matches and gaining a second County Championship winner’s medal in the final against Durham at Blaydon. The following year in which Gloucestershire unexpectedly lost all three group matches, he was dropped after a disastrous 11-6 defeat against Devon at Kingsholm in the first game, but played a full part for Gloucester and was once again amongst the players who made most appearances for the club that season. 1933-34 was an outstanding season for Gloucester and for Ernest Comley. The club won a record 29 victories in 39 games played, most notably a double (18-4 at Welford Road and 35-7 at Kingsholm) against an outstanding Leicester side in which they outscored their old rivals by 9 tries to nil. Comley caught the eye of the England selectors. He was chosen as a travelling reserve for the first trial, Probables v Possibles, at Birkenhead Park in December and then played for The Rest against England at Twickenham on January 6, 1934 in the final trial. He again played for Gloucestershire in all six County Championship games and appeared in his third County Championship final, although this time on the losing side against East Midlands at Franklin’s Gardens. That season was perhaps an Indian Summer for Ernest Comley. Although he played in all three of Gloucestershire’s County Championship games the following autumn in what was an unsuccessful campaign for the county, he only played once for the Gloucester 1st XV, against Bart’s Hospital at Kingsholm, and retired at the end of the year.